Cute character 1 1/2 story home. Bright bay windows in living room with wood burning fireplace, parquet wood flooring. Kitchen leads out to a deck facing the private back yard. Main floor has 1 bedroom and den, up has two funky bedrooms with cool roof lines + a Harry Potter powder room. Down is a separate 2 bedroom suite with its own washer/dryer rented for $1250 m/m. Huge 1 car garage structure at back has loads of storage perfect for workshop, etc. 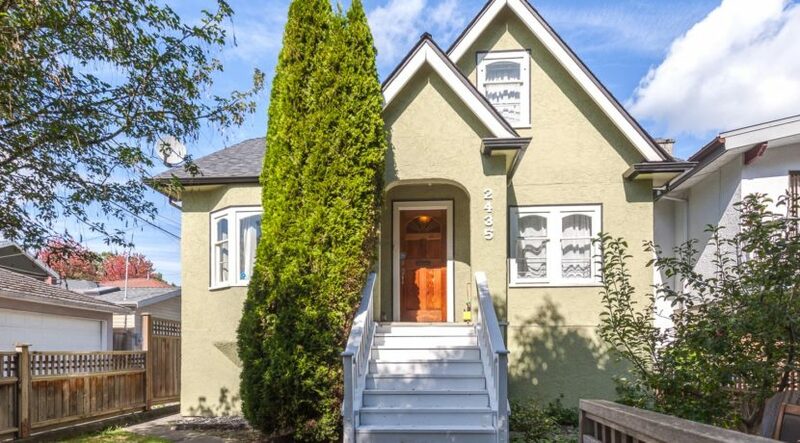 33′ x 122′ RS-1 lot with easy walking distance to private, public, French immersion schools, Skytrain and the Drive. PRIMARY: Children in this catchment attend the smaller Maquinna Annex from Kindergarten to Grade 3. The Annex provides two Full Day Kindergarten programs in addition to the Half Day Kindergarten program. Not only do students experience reading, writing, math, science, the arts, environmental education; they also build self-esteem and leadership skills so they are ready to meet the challenges of an intermediate program by the time children have worked their way to Grade 3. Students from Maquinna Annex may attend Maquinna Main School for Grades 4 to 7. At both schools, you will find a focused working environment with an atmosphere for calm, friendliness, and warmth. The strong emphasis on literacy provides an excellent foundation for the school to concentrate on developing the skills needed across many curricular areas.